Following extensive negotiations between the SDA and Just Group the proposed Just Group Retail Agreement 2019 is ready for you to consider. 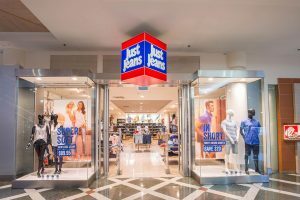 This page contains a summary of the differences between the proposed Agreement and the current Just Jeans Group Limited Retail Agreement 2009. After a consideration period, you will be asked to vote on the proposed Agreement. If the proposed Agreement is voted in favour by a majority of employees, it will go to the Fair Work Commission (‘FWC’) for approval and will commence 7 days after approval. The proposed Agreement will be for 4 years and will have a nominal expiry date of 3 April 2023. Copies of the proposed Agreement have been posted on noticeboards in stores and is available online on Just Us. Following a ballot of Just Group employees, a majority voted yes in favour of the proposed Just Group Agreement. 54% of eligible Just Group employees voted in the ballot with a 73% yes vote! The proposed Just Group Agreement will now go to the Fair Work Commission (FWC) for approval. The new Agreement will commence 7 days after approval by the Fair Work Commission. The proposed Agreement provides for annual wage increases from the first full pay period on or after July 1 each year. Increases to these rates of pay will be based on the pay rise the SDA, with the ACTU, secures at the Fair Work Commission in the Annual Wage Review (AWR). The increase will apply to all classifications. Penalty rates and casual loadings will increase under the proposed Agreement. 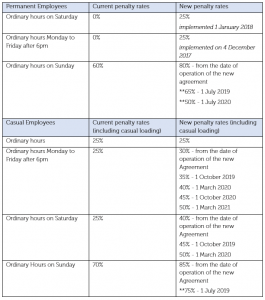 Some of these increases have already been implemented as a result of ongoing negotiations, including an increase in the late night penalty rate by 25% for permanent employees on 1 December 2017 and an increase to Saturday rates by 25% for permanent employees and 10% for casual employees on 1 January 2018. Casual penalty rates will increase over the life of the proposed Agreement for work on Monday to Friday 6pm to 11pm and on Saturdays. This is a result of the SDA winning our case in the Fair Work Commission for casual employees to receive penalty rates in addition to casual loading on weeknights and Saturdays. **Following the case run by employer organisations to reduce penalty rates in the General Retail Industry Award (Award) the Fair Work Commission (FWC) decided to reduce Sunday Penalty rates. Under the proposed Agreement your Sunday penalty rate will increase initially, and will then decrease over the life of the proposed Agreement in line with the decision of the FWC. There is proposed legislation that seeks to increase Sunday penalty rates in the Award that has not yet been successful. The Just Group has agreed that if Sunday penalty rates in the Award were to increase it will meet with the SDA and enter discussions regarding an increase to Sunday penalty rates in the proposed Agreement. Public holiday penalty rates have been reduced to 125% for permanent employees in line with the FWC decision. Junior rates payable under the proposed Agreement will be in line with the Award, which are lower than the current Agreement. For existing team members employed prior to the commencement of the proposed Agreement, the current junior rates will continue to apply. If time of ending of trading hours extends beyond these hours, the finishing time for ordinary hours will be 11pm. Overtime is paid for all hours worked outside of the spread of ordinary hours. The change is beneficial at the end of the day Monday to Saturday and at the beginning of the day on Sundays. Note: Under the proposed Agreement casuals will now be paid the casual loading in addition to the overtime rate. The overtime rates above include the casual loading. The overtime meal allowance has been increased from $13.20 to $18.29. A second meal allowance has also been introduced when overtime worked exceeds 4 hours. This second meal allowance is paid at a rate of $16.57. The meal allowances will increase in line with wage increases. Team members engaged for more than 2 hours during 1 day or shift on duties carrying a higher rate than their ordinary classification (as set out below) will be paid the higher rate for such day or shift. If engaged for 2 hours or less during 1 day or shift, the team member is to be paid the higher rate for the time worked only. Under the current Agreement a higher duties allowance was only payable in circumstances where a Store Manager was on an authorised absence for at least 1 week (where the store had an Assistant Store Manager) or 1 day (where the store did not have an Assistant Store Manager). Rosters for full-time and part-time team members will be made on a 2 week or 4 week cycle. The roster period will not be more than 4 weeks. Employees will not be able to work more than one shift on any day at the ordinary rate of pay. If you do work an additional shift in one day you must be paid for the second shift at overtime rates. Under the current Agreement permanent employees can be rostered for 2 long days (10.5 hours) per week or 3 per fortnight. Under the proposed Agreement, permanent employees can only be rostered on one long day (11 hours) per week. Rosters can only be changed in the case of emergency with 48 hours notice. Under the current Agreement it is 24 hours notice. Attendance at shorter, 2 hour shifts for training, product nights, meetings and stocktake have been limited under the proposed Agreement to a maximum of 4 occasions per year. Two weeks notice will be required, unless otherwise agreed, where possible they will be rostered before, during or after a shift and attendance will now be voluntary. Removal of the 20% reduction in part-time hours. The clause allowing Just Group to reduce a part-time employee’s core hours by 20% has been removed. When a part-time employee is first employed, a regular pattern of work will be agreed in writing. Currently, a part-time employee can be rostered to work between 9 and up to 36 hours a week and between 36 and 128 hours in a 4 week cycle. Under the proposed Agreement, a part-time employee can work between 6 hours and less than 38 hours and between 24 hours and less than 152 hours in a 4 week cycle. Overtime will now be payable to part-time employees for hours worked in excess of 38 hours per week and 144 hours in a 4 week cycle, under the current Agreement this was in excess of 36 hours per week and 128 hours in a 4 week cycle. A new provision is included in the proposed Agreement, following a successful case run by the ACTU and unions including the SDA in the FWC. Casual employees who have worked a regular roster for more than 12 months are able to request to be converted to permanent. The reference to casuals working 50 ordinary hours per week for the four weeks after the second Sunday in December has been removed. The minimum period a team member can be offered a limited tenure has been reduced under the proposed Agreement from two weeks to one week. A new annualised salaries provision has been introduced in the proposed Agreement. This allows Just Group to continue to pay Store Managers an annual salary, which under the proposed Agreement must be no less each roster cycle than the amount the Store Manager would have received under the Agreement. Payment of wages on termination will now be paid within 7 days of the day the termination took effect rather than during the normal pay cycle. Work on Public Holidays remains voluntary. The proposed Agreement no longer contains the provision for a day in lieu when your non-working day falls on a public holiday. The SDA fought hard to win this provision in the Award – which would have secured it for Just Group workers. However, the case was not successful and as a result of this we have not been able to retain this benefit in the proposed Agreement. The proposed Agreement provides for a 30 – 60 minutes meal break after 5 hours work, instead of 45 – 60 (30 by agreement). The SDA has been advocating for Family and Domestic Violence Leave and worked with the ACTU in its case before the FWC. Just Group have agreed to provide 10 days paid leave to full-time team members (pro-rata for part-time) and 2 days paid leave for casual team members for the purpose of family and domestic violence. The proposed Agreement also provides a further 5 days unpaid leave for permanent employees and 3 days unpaid leave for casuals. Family and domestic violence leave does not accumulate from year to year and is not paid out on termination of employment. The annual leave loading of 17.5% or the weekend penalties an employee receives whichever is greater will be paid during a period of annual leave. Annual Leave Loading will also be paid on any Annual Leave owing on termination. The proposed Agreement now specifies how Just Group can manage excessive leave accruals. Employees must have in excess of 8 weeks leave accrued, and must be given 8 weeks notice, and the taking of leave must not leave employees with less than 6 weeks accrued, or less by mutual agreement. Under the proposed Agreement, personal leave will accrue progressively throughout the year. Under the current agreement team members are credited with 10 days on each anniversary year. Employees may be required to provide appropriate documentary evidence (such as a medical certificate from a registered medical practitioner or a statutory declaration) on each occasion. Under the current Agreement, ill or injured employees are able to take 5 single days of personal leave per year without documentary evidence. The amount of paid leave available to employees for the purpose of compassionate leave has been increased in the proposed Agreement. 4 days paid compassionate leave for permanent employees has now been extended upon the death of a parent-in-law, grandparent, grandchild, sibling, step-sibling or foster-sibling, which was 3 days under the current Agreement. It has also been extended from 1 day to 4 days upon the death of a grandparent-in-law, sibling-in-law, son-in-law or daughter-in-law. Pre-natal leave has been extended to allow the use of personal leave to attend pre-natal services for their own pregnancy or their spouse’s pregnancy. Full time team members attending medical appointments with their pregnant spouse can access up to 22.8 hours of accrued personal leave for this purpose (pro rata for part time team members). There is no longer a cap on the amount of accrued personal leave that pregnant team members can access to attend prenatal services. The proposed Agreement provides for up to 2 days non-cumulative paid leave for permanent employees in the case of a yellow alert announcement for cyclones and floods and bushfires which pose a threat to property or create a need to care for children. Under the current Agreement Natural Disaster Leave is unpaid. The proposed Agreement introduces defence forces leave. Permanent team members may take up to 2 weeks’ leave per calendar year to attend Defence Forces Reserve approved training camps. Team members who are required to attend full-time training during this leave will be paid an amount equal to the difference between the payment received in respect of their attendance at camp and the total amount for the ordinary hours of work that the team member would have received during that period. The proposed Agreement introduces dedicated unpaid study leave. Team members may apply for study leave for up to 2 weeks per calendar year for the purpose of preparing for and participating in exams and assignments. Team members can take this leave as a continuous period or as single day absences. If an employee has exhausted all paid leave options, they are able to take up to 90 days’ unpaid leave by agreement with Just Group. Under the current Agreement this was known as “unpaid leave”. A team member is studying and requires time to attend exams or wishes to return to studies on a full-time basis. A team member who has exhausted their personal leave entitlement requires additional time off to fulfil family responsibilities including parental leave. Under the current Agreement, availability of unpaid leave did not expressly require exhaustion of all other leave options. The proposed Agreement introduces personal emergency leave. Team members can access up to 7.6 hours (pro rata for part time team members) of their accrued annual leave to attend to a pressing domestic emergency that requires their immediate attention. Relevant emergencies include a house fire, burst water pipes or burglary at the team member’s primary residence, and where the team member is required to attend to deal with emergency services or permit access by emergency personnel. Personal emergency leave is not available if the team member can access emergency services leave or natural disaster leave. Emergency Services Leave has been retained under the proposed Agreement. A permanent team member who is involved in recognised voluntary services including SES and firefighting is entitled to paid time off to attend to emergency situations which may affect the community as a whole. For local emergency situations, paid time off is limited to a maximum of 3 days per situation. For non-local emergency situations, paid time of is limited to a maximum of 2 days per year. Paid leave for the purpose of donating blood and bone marrow have been retained in the proposed Agreement. The entitlements under the current Agreement for Jury Service Leave have been retained in the proposed Agreement. Team members will be paid superannuation on all paid leave. All allowances, except laundry allowance, will increase in line with wage increases. The proposed Agreement introduces a new travel allowance for employees. Where Just Group requests an employee to use their own motor vehicle in performing their duties, the employee will be paid an allowance of $0.78 per kilometre. The proposed Agreement introduces a new recall allowance. An employee who is recalled to work before or after completing their normal roster, or on a day which they did not work, will be paid at the appropriate rate for all hours worked with a minimum of 3 hours on each occasion. Team members in the County of Yancowinna in New South Wales (Broken Hill) will be paid an hourly allowance of 94 cents, in addition to all other payments. This replaces previous location allowances. For team members employed prior to the commencement of the proposed Agreement, the location allowances in the current Agreement (in respect of Darwin, Alice Springs, Broome, Esperance, Karratha, Port Hedland and Kalgoorlie) will continue to apply. Currently, employees are not required to wear a uniform. However, if a mandatory uniform is introduced during the term of the proposed Agreement, a special clothing allowance or reimbursement will be provided in accordance with the Award. The proposed Agreement introduces a second meal allowance, where the overtime worked is more than 4 hours. The proposed Agreement increases the circumstances where team members are paid for travel time. Where a team member is required to work away from their usual place of employment, they will be entitled to additional payment in respect of reasonable time spent in excess of the time normally spent travelling from their home to their usual place of employment and returning. In these circumstances, team members will be paid for travelling time and also any fares reasonably incurred in excess of those normally incurred in travelling between their home and their usual place of employment. The proposed Agreement will be read in conjunction with the NES. Where there is an inconsistency and the NES provide a greater entitlement, the NES will apply. The dispute settlement procedure has been limited to when a dispute arises in under the Agreement or NES. The procedure has also been clarified to allow the Fair Work Commission to arbitrate where a dispute is unresolved. The Equal Employment Opportunity, Workplace Harassment clause has been removed. The company policy will apply.